Une tempête a abîmé les Counoise, Mourvêdre et Muscardin. Mais les vendanges se sont déroulées dans d'excellente conditions. Au nez, on trouve immédiatement la minéralité, des notes de fleurs blanches, le miel, la marmelade. 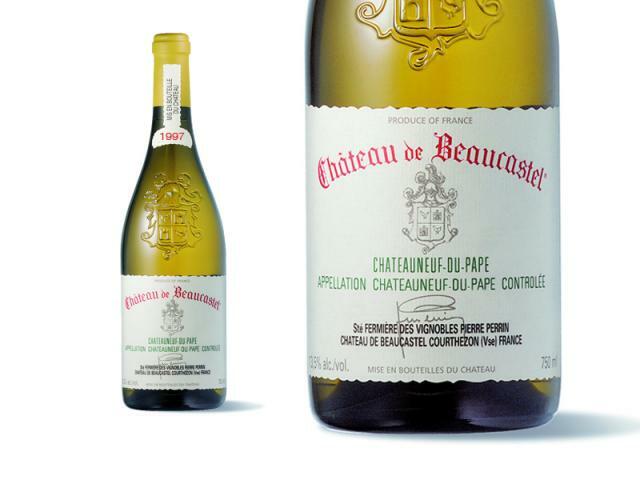 The 1997 Chateauneuf du Pape blanc (now packaged in an attractive heavy antique bottle) is a blend of 80% Roussanne, 15% Grenache Blanc, and 5% diverse white varietals. 1997 was an excellent vintage for white Chateauneuf du Pape, and this wine reveals the bold, fleshy, sappy, full-bodied fruit so evident in the vintage. The 1997 exhibits plenty of honeyed citrus and floral (rose) scents, an unctuous texture, good glycerin, and heady alcohol in the long, luscious finish. This impressively-endowed Chateauneuf is ideal for drinking over the next decade or more. This classy, distinctive white shows wonderful personality and fantastic balance. The smooth mouthfeel has a tight grip that explodes with cedar, spice, tropical, iodine, lemon and mineral notes, all swirling around beautifully. An ager for sure, but tempting now because of its full body. The ripe flavors linger on the bitter almondlike finish. Drink now through 2010. 1,665 cases made.